I've been working on block printing for a while and decided to go for something a little bigger than I had before, and with multiple blocks and colors. I also wanted to do something where I could vary the main print a bit by having different add-ons. 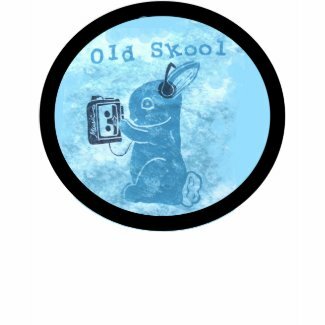 In this case, I have the rabbit as the main image, and the walkman can easily be exchanged for a cookie or a cross or a flower or whatever, and the text can be changed as well, making a totally different type of image. So I made a giant patch with it and put it on sale in my etsy shop, figuring people could stick it on the back of their hoodies or jackets, or on a tote bag or something. Clearly, the patch would need to be trimmed and sewn on, but I think it would make a cute design. You can get it here in my etsy store! I also used it as the basis for a zazzle design. 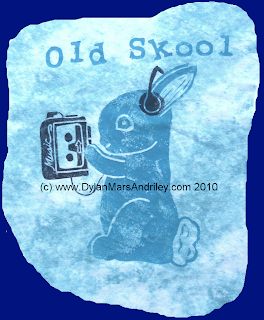 And you can buy the whole series of Old Skool walkman-wearing bunny stuff here in my zazzle store. Not sure if anyone else will think it's as funny as I do, but just me thinking it's funny is a start, no?